Known its good weather, Taichung boasts an interesting set of cultural attractions, including many temples showing the development of religious architectural styles in the area and forming focal points for most tours of Taichung. Kick off your visit on the 15th (Fri): stop by Mark Taiwan. To find maps, photos, other places to visit, and more tourist information, read Taichung journey planning site . Boracay, Philippines to Taichung is an approximately 8-hour combination of ferry, flight, and train. You can also do a combination of ferry and flight. Prepare for little chillier weather when traveling from Boracay in March: high temperatures in Taichung hover around 25°C and lows are around 16°C. Finish your sightseeing early on the 16th (Sat) to allow enough time to travel to Alishan. Kick off your visit on the 17th (Sun): get engrossed in the history at Alishan Museum, then take a peaceful walk through Alishan National Forest Recreation Area, and then delve into the lush surroundings at Fenqi Hu Old Street. 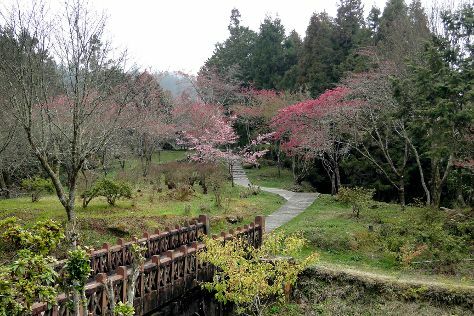 To see traveler tips, where to stay, more things to do, and tourist information, you can read our Alishan trip planner . You can drive from Taichung to Alishan in 3 hours. Expect a bit cooler weather when traveling from Taichung in March: highs in Alishan hover around 19°C, while lows dip to 18°C. Wrap up your sightseeing on the 17th (Sun) to allow time to travel to Taipei. Go for a jaunt from Taipei to Ruifang to see Chiufen (Jiufen Old Street) about 46 minutes away. And it doesn't end there: take an in-depth tour of National Palace Museum, make a trip to Chiang Kai-Shek Memorial Hall, steep yourself in history at Taipei Confucius Temple, and shop like a local with Taipei 101. To find more things to do, reviews, other places to visit, and tourist information, use the Taipei road trip planner. Drive from Alishan to Taipei in 4.5 hours. When traveling from Alishan in March, plan for a bit warmer days and about the same nights in Taipei: temperatures range from 25°C by day to 17°C at night. Finish up your sightseeing early on the 20th (Wed) so you can travel back home.